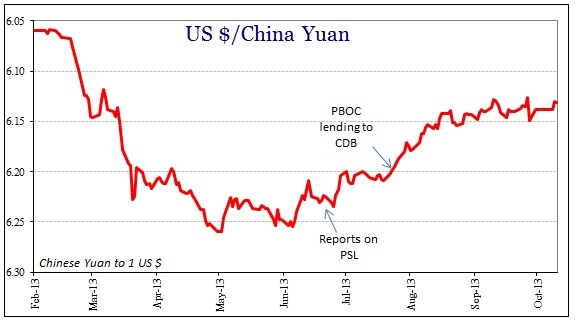 The PBOC continues along with its path of “targeting” liquidity rather than “flooding” as has been done in the past. Expectations for Chinese action, however, seem to be resistant to getting that message. This is not something that is just now being applied, as if a sudden and unanticipated change in thinking. The entire default drama at the beginning of this year was intended to signal that the “flood” was ending, though I think the PBOC failed to follow that up for fear of further upset. The entire point of the now-prominent SLF is exactly this targeted approach. The Wall Street Journal reports that this continues to be the only conduit the PBOC is willing to utilize. China’s central bank is planning to inject up to 200 billion yuan ($32.8 billion) into some 20 large national and regional banks, according to banking executives briefed on the matter, in another step aimed at spurring the world’s second-largest economy. The move—which is expected to channel money to areas the government deems important, such as public housing and small business—marks the latest of a series of targeted easing measures meant to arrest a slowdown in China’s economic growth. Last month, the People’s Bank of China pumped 500 billion yuan into the country’s five major state-owned banks. Until this year, slowing growth had almost universally been met with broad-based monetarism, including rate cuts in the repo market. Add that history to the growing sense that the Chinese economy may be worse than feared, and the “market” expectation for a new “flood” is somewhat understandable (particularly given the almost haphazard approach in practice), however misplaced. Central banks are into an age of secular stagnation in their thinking which is a total re-assessment of past behavior. In other words, they finally (FINALLY) recognize that the costs of “flooding” the world with economically useless and inefficient monetarism are high, and that the benefits are far too scarce (though almost everyone loves those asset prices, at least on the way up). That means not only is China eschewing broad liquidity expansion contrary to what is so often proclaimed, but rather the PBOC is actually recognizing, as are most other central banks, just how ineffective monetarism has been and can be. Furthermore, they are also under less illusion about the high cost of past monetarism, now looking to try to “thread the needle” of some monetary expansion that will not disturb the housing sector (bubble) in either direction. Call it managed decline or targeted growth without bubbles; whatever it is, it is a preposterous-sounding position to take. But not everything is as it seems. While the PBOC may be taking a stand on monetarism and its character, it has been very curious that the yuan has not fully participated in the dollar turmoil marking so many other “dollar” dependent nations. While the yuan’s appreciation trend may have been altered, that has not led again to the kind of disorder that marked the currency earlier in the year. Maybe that is due, at least in part, to these expectations that the PBOC will eventually relent on its new approach, but I also think that the PBOC is at least looking the other way on some of the “old tricks” that supported the Chinese version of the dollar short. Analysts at banks including Everbright Securities Co., Australia & New Zealand Banking Group Ltd. and Bank of Communications Co. said over-invoicing and over-reporting may explain the 34 percent surge in exports to Hong Kong from a year earlier. A discrepancy between Hong Kong data for imports from China and Chinese figures for exports to the city in the past highlighted the practice of over-invoicing that’s used to disguise capital inflows to bet on China’s rising currency. China’s exports increased 15.3 percent from a year earlier, the biggest increase since February 2013 and beating the 12 percent median estimate in a Bloomberg survey of analysts, according to government data released yesterday, prompting deja vu for some. Aside from the second paragraph where I believe the author attributes the wrong factor (not to “bet on China’s rising currency” but rather to keep the flow of dollars to the Chinese corporate sector that is very short), the description and the timing of this potential “error” sets it within the context of the rapid and dramatic “rise” in the “dollar.” The pressure was at its greatest in September, as the real and ruble can ably attest. I think that is a second unappreciated change that is taking place, and in some respects has already taken place. The dollar short was very European-centric in the 2000’s, owing to their ready participation in the housing bubble in the US (and I would even argue that the bubble itself was largely based on that European short). Since August 2007, Europe has withdrawn somewhat, if only in terms of marginal participation. That, however, does not mean that the dollar short goes away with Europe’s retrenching. This borrowing creates a currency mismatch. As long as the dollar (or euro) doesn’t appreciate too quickly against the borrowers’ local currencies, the debts can be easily serviced. The danger is that these large short positions could cause a squeeze and create a desperate search for scarce dollars — exactly what happened in 2008. I’m not sure I agree with the author’s tense on the squeeze – “could cause” maybe should be rethought to “has caused” given what transpired in August and September. Perhaps that was limited to Europe, Brazil and the usual suspects while the Asian shorts, as Chinese were over-represented, were steadied by the Hong Kong mess (which would have been collateralized by some real good or commodity). And that brings us back to the basic analysis of the dollar short – nobody really knows much about it. It exists independent of any statistical measure and in far too many cases, including and especially policymakers, independent of knowledge and experience (closed system? The dollar short is the empirical refutation of all closed system approaches in economics). As it is in 2014 we are still finding out it is probably bigger (IMF) and more widespread than even thought now after seven years of close involvement with it. That makes the indirect indications provided by TIC and dollar “flows” all that more concerning, especially as they represent a sort of proxy for liquidity health and systemic capacity. At some point it may become necessary for “someone” to provide all these “dollars” and if everyone is all short then there will be no one left to take up that side (rerun of 2008). Maybe it is enough to hope that the Fed will act, but history is conclusive that they will do so only after it is obvious; which is, by then, far too late. In that respect, the dollar “tightening” in both 2013 and now in 2014 has reinforced that history. But there is another element to consider, the PBOC being representative – that the “flood” approach is now pretty much discredited as a monetary measure. That would seem to suggest if the dollar short grows far more problematic, then central banks may not just be behind the curve in their planning but also and actually reluctant to step into that void with what would have to be a “flood” since doing so would refute their “evolution” in the other direction. That would certainly suggest a reason for allowing the Hong Kong “fraud” to return. Central banks are loathe to do many things, but at the top is admit mistakes.